Once the first step “Collect basic data” is performed, we pass to the ” step 2: Production Capacity “ of the ESP Nine Step Design Procedure. It consists on predicting the well inflow performance which represents the relationship between pressure and flow rate at the well face of an individual well and it is physically defined as the well flowing bottom-hole pressure (Pwf) as a function of production rate. It describes the flow in the reservoir. As discussed in the article “Well Inflow Performance”, the PI model is derived from Darcy’s law and is applied when the flowing bottomhole pressure (Pwf) is greater than the bubble point pressure (Pb) (fluids flow similarly to single phase flow). The productivity index (PI) is equal to the liquid flow rate divided by the well drawdown (Pr-Pwf). So that, the inflow performance curve is a straight line with a slope equal to (-1/PI). Vogel’s IPR is an empirical relationship based on reservoir simulation results of pure oil in solution gas-drive reservoir. Contrary to PI IPR, Vogel’s IPR could be used when the well’s flowing bottomhole pressure (Pwf) is below the bubble point pressure (Pb) and if the produced fluid is pure oil. 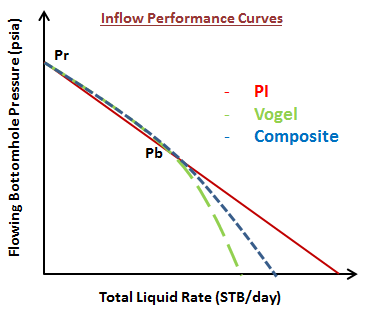 For more details regarding Vogel’s IPR, please refer to the article titled: “Vogel’s inflow performance relationship”. PI model is used for single phase flow (either water or oil/water mixture with Pwf>Pb). In the other hand, Vogel’s model could be used when the well’s Pwf is below the Pb and the produced fluid is pure oil. But what if the Pwf is below Pb and well’s produced fluids is a mixture of oil, water, and gas? In this case, the inflow performance could be described by the Composite IPR and IPR curve is somewhere between the curve valid for pure oil (Vogel model) and the one valid for Pwf > Pb (PI model). For more details regarding Composite IPR, please refer to the article titled: “The Composite Inflow Performance Relationship”.